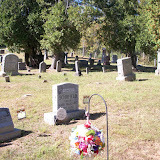 Wiley Cemetery Picture Slideshow. Click on the above picture. Brown, Carmen Darlene 10 May 1970 1 Sep 2008 d/o James and Mary Miller Fluharty. Fluharty, James Lloyd 24 Jun 1946 23 Jun 1994 s/o Harold and Imogene McAllister Fluharty. Fluharty, Myrtle O. "Odell" 13 Nov 1931 27 May 1994 d/o Charles and Mabel South Highley. Had an epileptic attack and drowned in the run while unconscious. Fluharty, Edward 23 Feb 1864 1 Sep 1912 .